We’ve all been hearing that mobile marketing has been dead since 2014. Google Trends as well has shown this particular trend falling for the past 5 years in the digital marketingspace. We believe otherwise – that 2017 will be the year where mobile marketing will really shine. Ever since the dawn of the iPhone (smartphone devices) in 2007, the mobile scene has changed forever. It became more than just a device for calling and messaging, it became part of our lifestyle – to always be connected wherever we go. 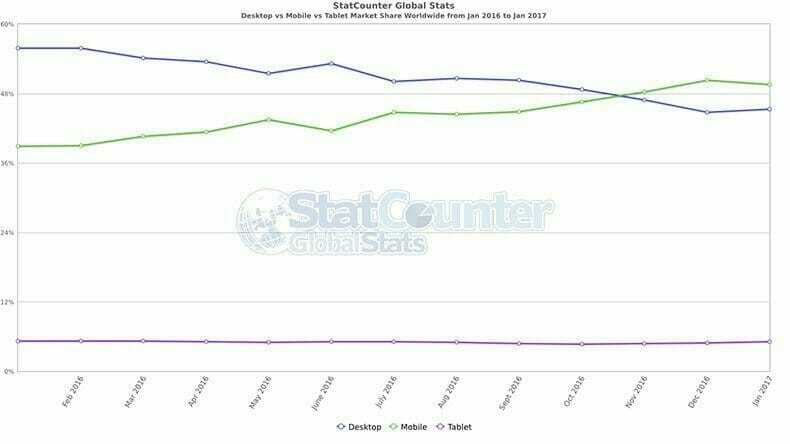 According to StatCounter Global Stats, the usage of Internet on mobile surpassed desktop last year (October, 2016). This means that roughly 50% of your potential visitors today are viewing your website on mobile, and has increased the urgency of having a mobile-friendly site. In fact, way back in May 2015 – Google had already confirmed that more searches were already happening on mobile vs desktop in 10 countries including US & Japan. This has proven that the demand and reach is definitely there on mobile. Mobile surfing has indeed come a long way, from the GPRS to 3G and 4G mobile speed. Singapore is also all set to provide 5G services in the near future, which are supposedly 10X faster than 4G ones. These are projected to be launched in 2020. Because a report from Google – ‘The need for mobile speed’ (Doubleclick) highlighted that 53% of mobile users abandon sites that take more than 3 seconds to load. Mobile surfing speed definitely plays a part in faster loading of sites, especially heavily-featured websites. 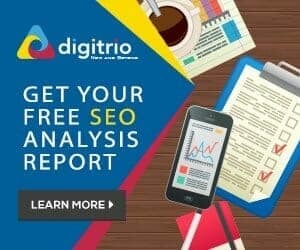 Google released a significant new mobile-friendly algorithm aka Mobilegeddon (Name given by Search Engine Land) in April 21, 2015. It was designed to give a boost to mobile-friendly pages in mobile search results. The 2nd version was subsequently fully rolled out in May 12, 2016. This has caused a panic wave especially in the SEO community, as site owners rush to invest in mobile-friendly websites to improve/maintain their ranking in search. In November 4, 2016, Google announced that they would be shifting to a mobile-first indexing. What that means is that Google will be primarily looking at the mobile version of a website for its ranking signal and will fall back to the desktop version only when there is no mobile version. These pivotal changes and algorithms all point to the importance of going mobile and mobile marketing. 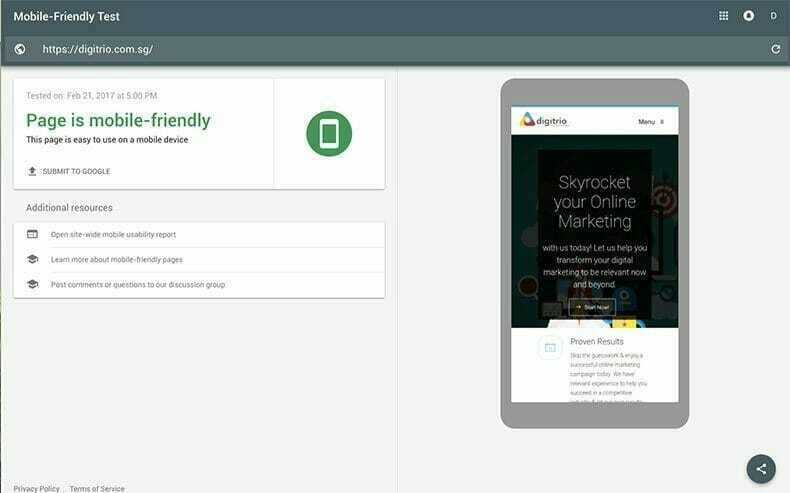 You can check if your website is mobile-friendly using Google’s own mobile-friendly tool, and the set of mobile guidelines they have put in place. To further push mobile forward, 2 of the largest tech companies, Facebook & Google have introduced new features like Instant Articles & AMP. Instant Articles is a feature by social networking company Facebook. Launched on May 12, 2015, this enables publishers to optimize content for instant readability on mobile. This reduces waiting time for users, and enables them to view the complete article on Facebook’s app – with formatting similar to that on the publisher’s website. A boost in shares – after readers complete at least 50% of an article has also been noted. AMP, or Accelerated Mobile Pages is a Google project designed by Twitter – to make super-fast mobile pages. Launched on February 24, 2016, it’s essentially an HTML page that’s an open standard for any publisher to have pages load faster on mobile devices. A study has shown that publishers using AMP mobile pages had 80% higher viewability. Biometrics has been in use for the past 3 decades, and is now being increasingly used as a form of authentication across mobile devices. This technology is used in optical scanners, capacitive scanners, ultrasonic scanners, and algorithms and cryptography. This is currently being used by the government, enterprises, and finance and banking sectors. What’s more, ultrasonic sensors, which use ultrasound to scan a 3D image of your finger, make it more secure. This has definitely paved the way for more usage in technology now available in mobile, such as for Mobile payment or other secure forms of usage. Any guesses for the 1st online purchase ever made? Some believe that it was for a pepperoni and mushroom pizza from Pizza Hut – way back in 1994 or even as early as 1984, when a British grandmother apparently ordered groceries online. Fast forward to 2020 – it’s estimated that 90% of smartphone users will have made some sort of mobile payment. Mobile payments have been constantly evolving, and more recognizable brands have already taken their share of the pie with ApplePay, SamsungPay and Android Pay. Singapore is one of the leading worldwide markets for contactless payment, and a study has also shown that Singaporeans prefer using mobile wallets to pay. A recent cash crunch in India has also paved the way for acceleration of mobile payment adoption. All these definitely point to even more growth, as more payment technologies like tokenization emerge to further enhance mobile shopping security. 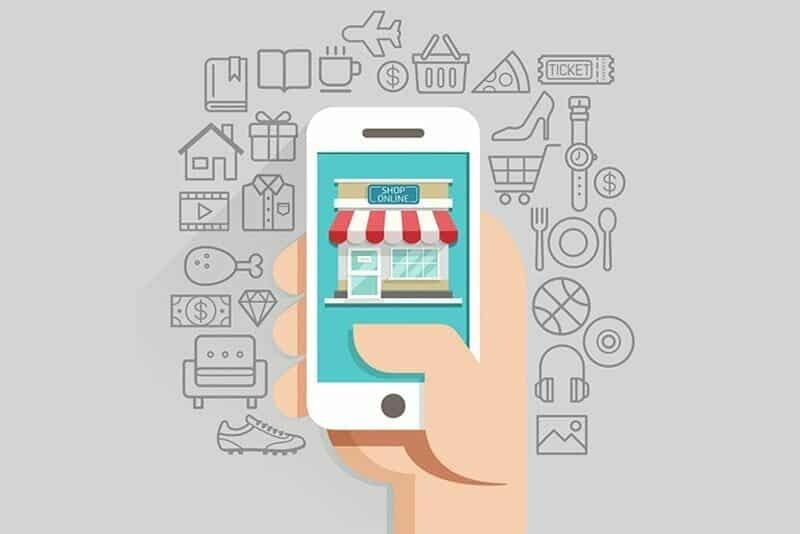 Mobile Shopping has also had a huge impact on e-commerce, and this can be attributed to increased smartphone ownership. By 2025, Singapore’s e-commerce market is expected to make up 6.7 per cent of all retail sales. This is expected to be worth US$ 5.4 billion, up from US$ 1 billion in 2015. This is the highest proportion amongst all surveyed Southeast Asian countries. The best part is that 50% of the traffic is expected to come via mobile devices and is expected to grow with more secure payment methods using Biometrics, for mobile payment like ApplePay, SamsungPay and Android Pay. Market maturity and adoption together with a huge push from Google & Facebook definitely has made mobile marketing essential in the year 2017. What’s more, mobile marketers are already winning with mobile marketing automation, as clearly reflected in this blog. This is all going to make mobile marketing even more exciting. Mobile Video will be a Game Changer – The mobile video market is expected to reach over $13 billion by 2020. Watch out for video ad formats such as vertical, 360 degree and virtual reality (VR) videos. Mobile Remarketing is the new CRM – Mobile remarketing is all set to become the new CRM platform, and app remarketing will help brands boost their rate of user engagement. 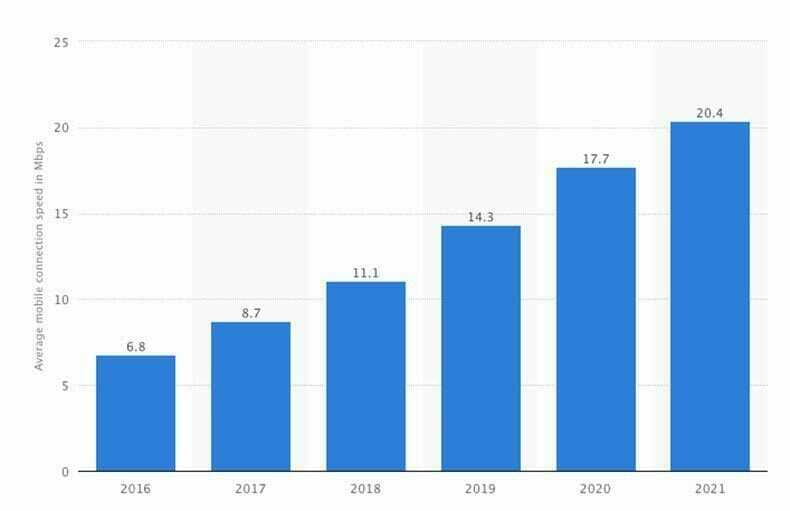 Mobile Programmatic will become Important – As per eMarketer, almost 75% of all programmatic ad spending will be mobile-related, whereas desktop will get just 25%. AR & VR to Expand – As AR & VR becomes increasingly widespread, apps will expand to other sectors such as retail and real estate. In terms of revenue, it’s expected to bring in as much as $162 billion by 2020. Thanks to the constantly-changing technological advances, mobile marketing trends are always changing. In order to be successful, marketers should always monitor the current state of affairs and constantly push their limits. All this clearly shows that we can no longer ignore mobile marketing! Let us know what you think of it below. Previous Post 7 Deadly Google Ads Mistakes You Need to Avoid Today!